Providing simple DMX scene capture and recall functions, this range includes control panels with faders or push buttons, and a DIN rail mounted version. The compact design, 'comprehensive programming options, and uncomplicated controls' make them suitable for architectural lighting applications, as well as small-scale lighting controls for drama and video studios. 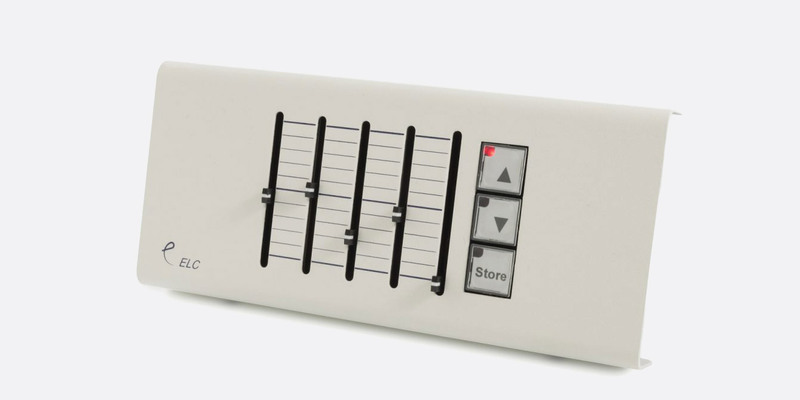 All products in the range may be programmed using AC612 Editor software for PC and Mac, and the panel versions include 'store' push buttons to capture the connected DMX signal. They give access to 512 DMX channels and a total desk capacity of 126 chase step lengths and times. Master up/down fade buttons control lighting states from 0% to 200%. This is a desktop controller with ten faders on the upper surface. It provides DMX scene capture and playback of thirty memories, all available independent top mounted buttons. Each memory can be a single lighting state (up to 512 channels) or a chaser (126 chase steps capacity) with individual period and crossfade times. 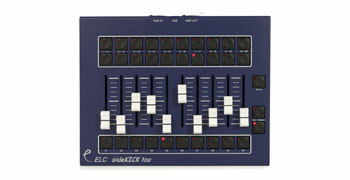 The faders allow master control from 0 to 200%. The programmable functions are provided by the AC612 editor freeware. At the rear there are both male and female 5-pin XLR connectors for DMX input and output which can also be used as a programmable DMX merger.The controller can work as a standalone control, a backup desk, or to control other software applications, such as GrandMA OnPC. Dimensions: 200 x 40 x 250 mm. Weight: 1.35kg. Power source: 9-24V DC, 200mA from included external power supply. These controllers all use the AC612 editor freeware for programming functions to provide DMX scene capture and playback of twelve memories. 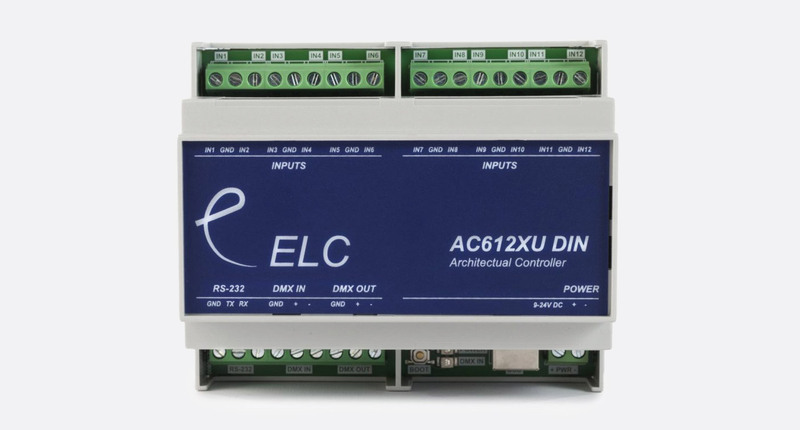 Each is in a different physical format ranging from a DIN rail mounting controller with no controls to a control panel with six memory buttons and three memory faders. Each memory can be a single lighting state (up to 512 channels) or a chaser (126 chase steps capacity) with individual period and crossfade times. USB-B connection is utilised for firmware upgrades and programming, with some units requiring this port for a universal USB power supply. This DIN-rail mounted version is designed for system integration. It has terminals to connect contact closures for each memory or chase; hard-wired connections for keyboard functions can be used to build custom buttons and switches for projects. There are twelve 2-pin screw terminals for connecting the switches, one for power and DMX I/O is presented as two sets of 3-pin screw terminals. Programming functions are provided by the AC612 editor freeware via a USB connection. Power source: 9-24V DC, 200mA external power supply required. Mounting: 35mm DIN EN 60715 rail mount, DIN 43880 form factor, occupies 6 DIN module spaces (108mm). These offer the same data capture and playback function as the AC612 DIN, but operated and displayed in a playback panel with 12-memory push buttons. The XUB has screw terminal connections at the rear of unit and requires an external power supply, 9-24V DC, 200mA. AC612 XUBX has all the functionality of the AC612 XUB, however it has 5-pin XLR connections and support for the included universal USB power supply. These offer the same data capture and playback function as the AC612 DIN, but operated and displayed in a playback panel with 12-memory push buttons. The XUB has screw terminal connections at the rear of unit and requires an external power supply, 9-24V DC, 200mA. Alternatively the XUFX variant enables DMX connectivity via XLR, as well as support for an included universal USB power supply. Dimensions: 80 x 180 x 23 mm. Weight: 0.5kg. This is a combined playback panel providing 6-memory buttons of 512 DMX channels, individually recalled by a push buttons and 3-memory faders. Termination is presented on screw terminal connections at the rear of unit which requires an external power supply, 9-24V DC, 200mA. AC612 XUBFX has all the functionality of the AC612 XUBF, however it has 5-pin XLR connections and support for the included universal USB power supply. Dimensions: 80 x 180 x 23 mm. Weight: 0.5kg.